In a generous and marvelous move, Soho Press just published (available as of yesterday) a marvelously wicked set of stories by Swedish author Helene Tursten. 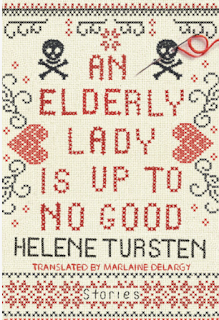 No, it's NOT related to her powerful Detective Inspector Irene Huss series ... instead, it's a set of situations that the elderly and solitary Maud finds frustrating. Living alone quite nicely, and in her eighties, Maud shouldn't have to put up with extreme frustrations, should she, at her age?? Fortunately for the clever protagonist of AN ELDERLY LADY IS UP TO NO GOOD, Maud's scruples regard principally her own comfort. If it's necessary to undertake criminal action in order to protect her way of life, her main concern is not to be a suspect -- and of course, not to make a huge mess of her charming apartment. The five stories are neatly tucked into a darling hardcover book, about 4 by 6 inches -- yes, it will fit into most stockings, and definitely won't be guessed right away at a Yankee Swap party (you don't know about those? click for details of this odd New England custom). Maud's luggage consisted of a suitcase and a sturdy stick with a rubber spike on the end. The stick had been leaning against the wall by the door of the clinic when she went to see the doctor about the problem with her eye. She had picked it up on the way out. You never know when something like this might come in handy, she had thought. Oh, there is a short cameo appearance by Detective Inspector Huss near the end -- but is she good enough to tag Maud for any crime? Have fun discovering the answer. I'm getting a modest stack of copies myself. This book is solving a lot of problems for this not-yet-elderly lady, and may prevent my having to take some of Maud's steps!